Peace Signs, Purple and Pinwheels! 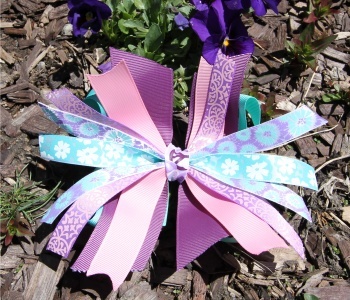 This bow is a bundle of fun mixed with flowers, pink, purple, and turquoise colors. Looking for a bow that has plenty of layers bursting out all over, then this is your bow. The bottom layer is a 1.5" turquoise ribbon that has the pinwheel on top. The pinwheel has 1.5" purple ribbons, 7/8" pink ribbons, 5/8" satin ribbons of purple and pink swirls, purple burst flowers and turquoise sparkling flowers. The center is wrapped with a satin purple ribbon that has purple and white peace sign on it. Designed by Lexa Lou's little sister to capture all her favorite colors. This bow is sure to be a perfect match for your little one too.